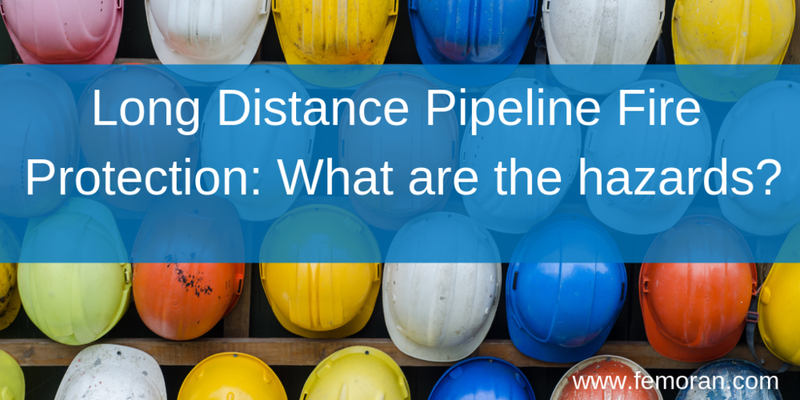 Long Distance Pipeline Fire Protection: What are the hazards? On September 18th, 2018, a series of 80 explosions erupted throughout Merrimack County. Natural gas leaked from over-pressurized pipelines and bled into the surrounding air. The resulting fires were devastating: one person died, 25 others were injured, and 131 structures were damaged. Thousands of residents went without natural gas while the gas company worked to replace 50 miles of pipeline. A lengthy investigation into the cause and pipeline fire protection protocol was opened. When you turn on your gas stove or fill up at the gas station, the chances are high that those fuels traveled long distances, via pipelines, to reach you. Approximately 2.5 million miles of natural gas, oil, and petroleum pipelines traverse the United States. These hazardous materials are transported to processing plants and converted into commercial and residential fuels. Pipelines are widely considered a safe, effective method of hazardous material transportation. Despite the good reputation, incidents like the Merrimack explosions do occur. This can be catastrophic without adequate pipeline fire protection. According to the PHMSA (Pipeline and Hazardous Materials Safety Administration), the top causes of oil and gas pipeline failures are corrosion, pipe/weld material failure, excavation damage, and natural force damage. The recipe for disaster: pipeline failure, leaks, and an ignition source. The main causes of explosions are equipment failure and human error. Once a gas leak is present, all it needs is contact with a flame, something as small as a pilot light, to create an explosion. Taking precautions to avoid pipeline failure and recognizing the signs of a leak are the most important steps to preventing a fire. • Call Before You Dig: Most pipelines are buried underground. Everyone should call 8-1-1 before digging. This national number connects callers to a pipeline operator that will inform them of pipeline depths and locations on the property. • Recognize a Pipeline Leak: There are many visual and auditory cues to detect a gas leak. Gas detection systems are a reliable, fast way to detect leaks before they grow out of control. • Evacuate and Suppress Fires: If a leak is suspected or confirmed, clear the area and call for trained Emergency Professionals. Fire suppression systems can assist in suppressing flames. What Fire Protection is Needed for Pipelines? Chuck Rogers, General Manager at The Moran Group, says it’s all needed. “The collecting, processing, refining and storage facilities in upstream, midstream and downstream sectors present some unique fire protection challenges requiring nearly every type of fire protection available,” he states. Water spray, foam, and clean agent suppression systems, and fire and gas detection systems are commonly used to protect property and assets throughout the entire process. In addition to pipelines, petroleum and gas products are also transported by rail, barge, and truck. This constant shifting of hands, vehicles, and locations puts the materials at greater risk for explosions due to leaks and human error. Water spray and fire and gas detection systems are used at transition sites to curb these risks and provide fire protection, cooling, and vapor protection. Check out our Fire Protection Glossary for more information on these methods. Although incidents are rare, thorough solutions for fire protection are necessary. Incident response plans are critical. The pipeline network in the United States alone is long enough to wrap around the earth about 100 times. It remains the most effective way to transport the materials that fuel our daily lives.